Life Before the Dinosaurs: Dinocaridida. Dinocaridida is the group which contains anomalacarids such as Opabinia and Anomalocaris. There has been much debate over what kind of animal members of Dinocaridida actually were. They possess jumbled-up features of two groups of modern animals, the arthropods and the onychophorans. They lived on every continent except Antarctica. Only one species has been found in Africa so far, an unnamed Ordovician anomalocarid very similar to Peytoia (formerly Laggania). Very few have been found in Europe. Most are found in North America and Greenland, with notable specimens from Asia too. From top to bottom: Jianshanopodia, Kerygmachela, Pambdelurion. Arrows represent method of capture. The first Dinocaridids, from the early Cambrian, looked more like onychophorans than arthropods. Some had no eyes, like Kerygmachela and Pambdelurion. Kerygmachela had a tiny mouth, which would have meant it needed to chop up its prey before it ate it. It did that by means of its knife-like claws, which shredded prey. The inward-pointing hooks on the spines would have prevented escape. Although it sounds ferocious, Kerygmachela was only about the size of a human hand. Its relative Pambdelurion, which was the same size as Kerygmachela, was a peaceful filter feeder which captured millions of tiny plankton with its hairy claws, which it then "licked" off with its tiny mouth. On the other hand, Jianshanopodia had a unique method of capture. With a motion of its claws and the opening of the mouth, it sucked small creatures into its stomach. Jianshanopodia was also about the size of a human hand. 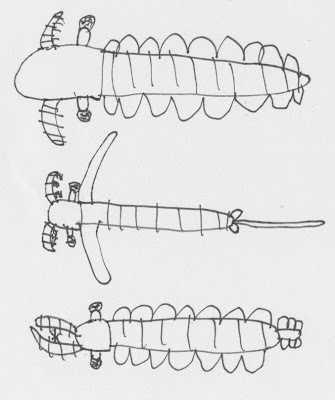 Typical anomalocarids from the middle Cambrian Burgess Shale were much more complex, looking like a cross between arthropods and onychophorans. Among these, Opabinia was unique. It had a long proboscis with a claw at the end. 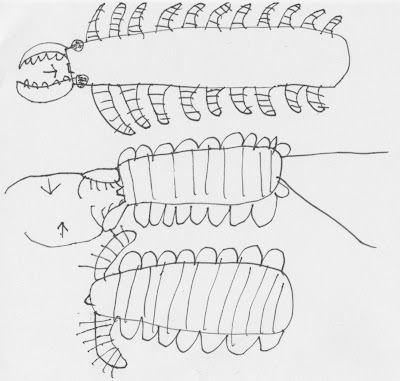 The mouth was not on the proboscis, but was actually under the head, as in all Dinocaridids. The proboscis was long and flexible, which helped it reach down worm burrows to grab hapless worms, which it ate. Opabinia was also a scavenger of dead arthropods and other animals, which it was very fit for, because of the flexibility of its proboscis, which enabled it to reach into cracks in the armor of a carcass and rip out chunks of internal organs and flesh from beneath the exoskeleton. It also had five huge eyes, which is not unusual in modern arthropods. Many insects have five eyes, except three of those eyes are tiny. 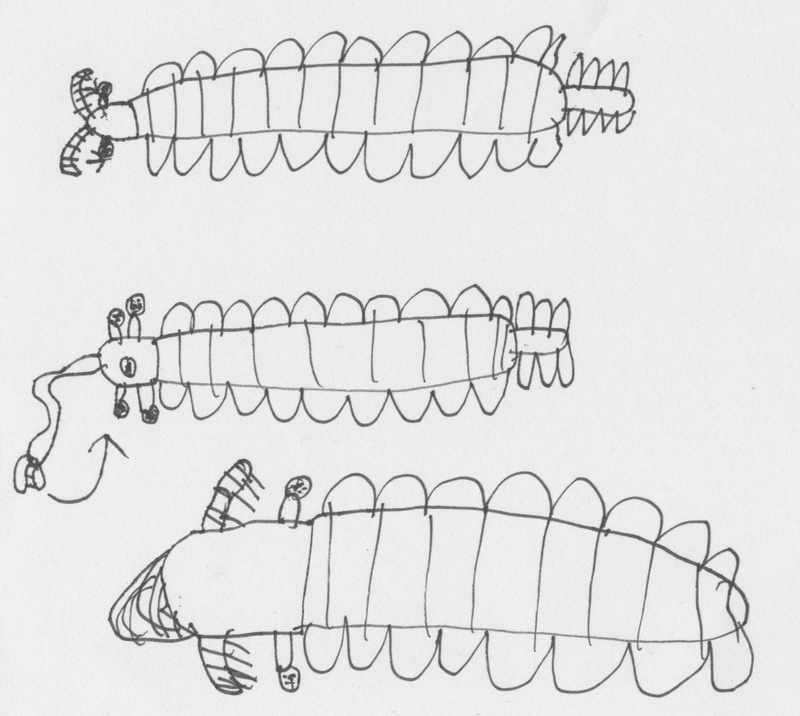 In Opabinia they were all large. Anomalocaris was a top predator. It could grow to three, possibly even six feet long. It shattered exoskeletons of trilobites and other arthropods with its two seven-inch claws. Like all Dinocaridids (except Jianshanopodia), Anomalocaris had eleven lateral lobes, which it used for swimming. It would have been very stable, and also able to swim backwards. It could hover motionless in mid-water for a long time watching for prey. When it saw something promising, Anomalocaris would lunge forward with its claws flared out, and then grab the food item. It would then rip it to pieces and eat it. Peytoia was a filter feeder. I hypothesize that it rammed predators with its huge head, partially because the eyes and claws were set far back, which could have meant the head was doing something that its eyes and appendages should not be involved in, such as head-butting predators. I also think it could have been a mating display, where the males head-butted each other for the right to mate with the females. This could have been possible because only a few specimens showing the head have been found, and it's possible that all of them were males. I'm not really sure what that huge head was for, I just realize that Peytoia had a bigger head than any other Dinocaridid (except for Hurdia, which had strange headgear that made it look like an arrow). Peytoia also had no tail fin, and when wandering around it probably moved very slowly, although it could have been quite capable of bursts of speed. Recently, Ordovician fossils of a Peytoia-like anomalocarid have been found in Morocco. 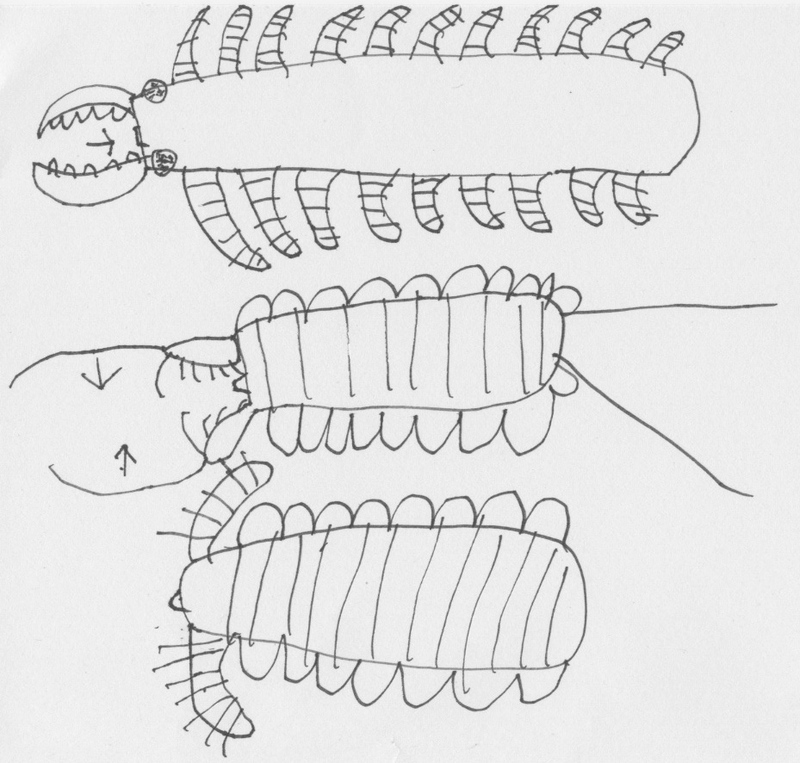 My drawing of this unnamed animal above is based on the pictures of the fossils that I saw. 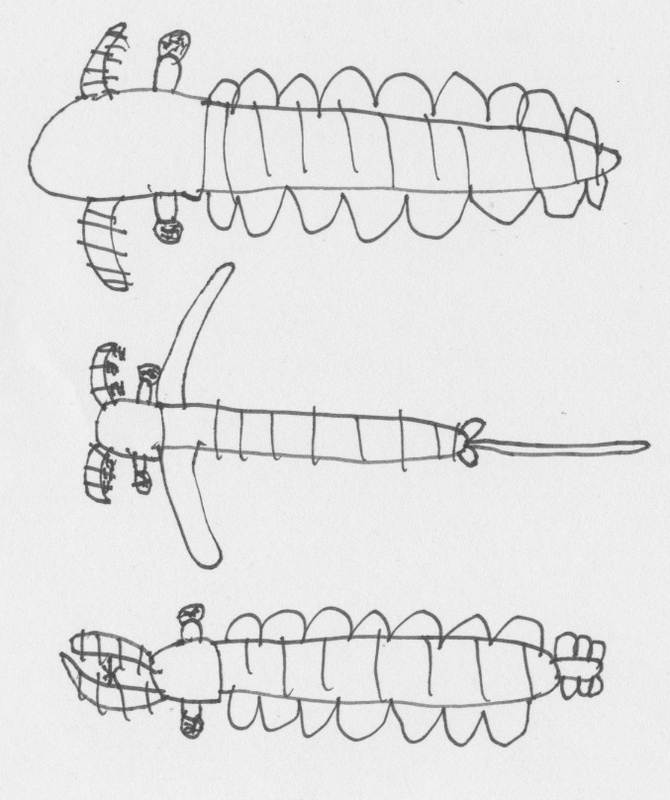 Schinderhannes bartelsi is the most recent anomalocarid (in geological time). It had two huge flaps right behind its head which propelled it through the water. It had a stingless spine at the rear and no lateral lobes along its sides. The only fossil was found in Germany. It was only about four inches long and it preyed on animals such as small shrimp and worms. Caryosyntrips is a new discovery from the Burgess Shale of the middle Cambrian. The feature that stands out about Caryosyntrips is its claws. Instead of grabbing down, as in Anomalocaris, they pinched together like crab claws. They have been compared to nutcrackers. 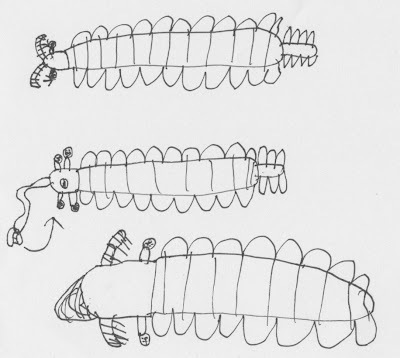 My favorite thing about Art's drawings is that he does these completely from memory. Artie - Life Before the Cats - You heard it here first. I've been doing my blog for one whole year!